We're going to try something new on this post. I'll be organizing the pictures differently, then I'll talk about the model itself and then a bit about it's mechanics. It's totally going to be a live-fire test, so lets all hope we don't blow a hand off... the zombies might run off with it. First up, we'll start with the Hero of the pack, Zombie Survivor Marie-Claude. Marie-Claude is the Hero of this Warband pack. She brandishes a rolling pin and frying pan in true survivor fashion. The mini herself is based on model Marie-Claude Bourbonnais, who is one of Soda Pop's more famous booth girls and has made appearances in Relic Knights, Tentacle Bento and Karate Fight! as well. Normally I don't like following the card artwork, but I knew I wanted to keep her skin tone and hair color the same. Her hair was painted by base coating it with Ushabti Bone, a wash of Seraphim Sepia, more Ushabti Bone, then I started slowly adding drops of white into it. I think it turned out pretty good. After the skin and hair was done, I needed to decide on a dress color. While I am a big fan of red, I wanted to try something different and it came down to pink or blue. Blue won out. To finish her off, I went with an yellow bow to go with the blue dress. On to the game stats! Survivor Marie-Claude has a movement of 6 and 3 action points, pretty standard for a human hero, 5 hearts and the very nice ability to carry two potions. The her potions are kind of a big deal too. Her Hearty Grog has the ability to Heal 1 wound and Remedy, which removes all status effects from the model that drinks it. She's also a melee machine. She comes packed with 3 Blue Dice for STR and an ARM of 2 Red Dice, which isn't too shabby. Her only basic attack is a melee range of 1 and she has no ranged attacks at all. She's meant to be in the thick of it, cracking monsters with her rolling pin and frying pan, which are also the names of her two offensive abilities. Rolling Pin is a melee attack with Sweep 2, which actually lets her hit all models in front of her, 2 rows deep. Frying Pan is a melee range 1 attack that adds an extra Red die to her attack roll and causes Bane on the target. On top of this, she's also Tough, which allows her to regenerate 1 wound each round, giving her more staying power in the front lines. Next up, lets check out the new pet in the set, Mr. Bitey the zombie rabbit. The first new pet, that wasn't a version of Cola or one of the base set pets, Mr. Bitey is a zombie rabbit, which seems fitting for this set. He was actually intended to be a crossover mini for Ninja Division's canceled board game Rabbits vs. Zombies. The artwork has him as a white rabbit. But, I really didn't want to paint him up with white fur, because I felt that white fur painted dirty might end up just looking sloppy. Instead, I opted for dark brown fur with a light brown tail. I started with a base coat of Rhinox Hide and then washed it down with a green wash before layering on more Rhinox Hide and lightening it up with lighter browns. Each new layer of lightened Rhinox Hide I painted on, I would follow with another strange colored wash. I believe I used Green, Sepia, Brown, Fleshshade, and Purple at different times on his fur. The chewed sections were painted using Khorne Red and then washed with a bit of brown wash, before getting a Khorne Red highlight. Pretty simple and it gives it a nice bloody look. Mr. Bitey comes to the game with 6 movement and 2 action points. He also grants his master Berserk, which lets them do a melee attack action for free, instead of spending action points to do so. Being a pet, isn't meant to be a major player in combats. He has no Hearts, which means 1 hit and he vanishes. If this happens, his master must use an action point to summon him back to the board. He does have 2 stars of ARM though, which gives him an OK chance of survivability. Also if he does get into melee he can use his two action points to add an additional Red die to his attack. So, he can be helpful in combat, as long as he survives. Now that the goody goodies are out of the way, it's time to dig into the new Grabby House spawning point. The Grabby House is a neat little sculpt and I had fun painting it. The arms made for a few frustrating moments. But overall, I really like this mini. I liked the idea of making the house clean looking and cutesy, offsetting the gruesome zombie arms and undead theme of the whole set. That said, I wanted to keep it brighter in color. I had thought about painting the brick areas white and then painting each brick red, but after thinking on it for a bit, I decided that it would have looked funny and instead decided to paint the whole section red and follow it up with Nuln Oil and some dry brushing. Originally I had painted the crystals green, but after I had the house partially painted I realized that they needed to be darker. So I painted them black with purple highlighting, like I did with the crystals from the Von Drakk Manor set. Overall, I like how it turned out. But I had some issues with painting the arms and the door way's glow effect. The Grabby House is the spawning point of the Stilt House Zombies expansion. It is a paired spawning point, which means it needs to be taken in sets of two when selecting which spawning points will be used in the game. Since it's a spawning point, it has no movement or actions. It is immune to status effects. It has an ARM of 1 star and 4 Hearts. Each spawning point has an aura it gives off, and the Grabby House's is the aptly named Grabby Hands. Grabby Hands gives all monsters with Sapphire affinity and within 2 squares of the Grabby House the keyword Grabby. Grabby's wording is "A model that is adjacent to an enemy model with Grabby may not move". The Grabby House also has Grabby. I had a lot of fun with the Shamble Priest. He's a voodoo witch doctor and at first I thought about painting him up with black and white stripes on his hat and coat. Then I thought of painting him like Baron Samedi from Live and Let Die. But after I got started on him, I really liked the idea of painting him up with a purple coat and brown hat, ala Willy Wonka. He's the first Super Dungeon Explore mini I've painted with dark skin and at first I wasn't sure about it. Mainly because I've not had a lot of practice with dark skin tones. But thanks to my previous work with Star Wars Imperial Assualt's Giddeon, I was able to do a pretty solid job on it. The purple coat ended up being a great choice as well, as it complimented the green flames coming from the skull, very nicely. I'm also very happy with the feathers in his hat and the playing card tucked into the band of it. It's possible, he's one of my favorite paint jobs for Super Dungeon Explore so far. Shamble Priest is a Witch Elite, he has a movement of 6 and 3 action points as well as 3 wounds and is worth 2 skull points. He's a 16 bit monster, and as such he is the "big bad" of the Grabby House's spawned monsters. He's more inclined to stay away from melee and prefers to sling magic attacks from afar. He has a 2 Red Die WILL attack, with a range of 6, but also can melee at 2 Blue Die. His main offensive special action is called Pin Cushion. It has Magic attack range of 8, with Hookshot which lets his attack around corners. It adds 2 Blue Die to his WILL attack roll and if it hits, he inflicts the target with both Bane and Hex, reducing both their offense and defense. He can also spend 1 action point, deal 1 damage to himself and summon a Zombie of any kind to his side. Allowing the Dark Consul to bypass the spawning rules slightly, and get more monsters into play. Finally, he can also spend 3 action points to give all zombies within a Wave 3 distance from him a free melee attack, adding to the damage output. He's definitely a fella that needs to be taken care of, as soon as he's on the board. The Swampies were actually the second set of zombies I painted for this set. They turned out well, but I had some issues with deciding on colors for their clothes. This is actually a problem I had with all of the zombies. I tried to keep them looking dirty and as such, I didn't highlight as much as I normally would have and the clothes are practically a base coat covered in different color washes. In the end, I'm pretty happy with them and at first I didn't like their skin at all, but now that's grown on me as well. The red shirts ended up being a good choice, it made seeing them on the board a lot easier and I could easily tell them apart from the Prowlers at a glance. Swampies are the generic "Romero" zombie of the set. They are Undead Zombie Minions and are an 8 bit class monster. They are slower than the standard humanoid models, at 5 movement and only have a single action point. They're frail as well, and only have 1 star ARM and 1 Heart. Swampies only have 2 Blue Die for melee at a range of 1, but they have Mob to help them hit more consistently, which gives them up to 3 more Blue Die per attack. One per each friendly model adjacent to an enemy model they are attacking. That can be brutal, if you have multiple of them attacking the same target. These fellas also have Grabby, which can get really annoying for heroes trying to move passed them. I've found that these guys totally bone the Claw Tribe Barbarian's main ability, which lets her attack after every move. If she's adjacent to multiple of these guys, no moving means no Rage attacking. The Prowlers were the first zombie from the set that I painted, and I think that they are the best painted. When I painted them, I just started messing with colors and playing around. As such I didn't really pay much attention to the steps. They've had a lot of compliments and folks wanting to know how I paint my zombie flesh. But for the life of me, I cant get it down to an exact science yet. Once I do, I'll be writing a tutorial on it. but who knows when that'll happen. I really like how his pants and vest turned out. I've always had a problem with painting black and getting proper highlights out of it. For this one, I tried adding some dark blue to the mix and highlighting it up to just the dark blue by itself. It seemed to do a good job of it. The shirt was painted with a basic coat of Ushabti Bone and then washed with sepia wash and then a quick highlight. Prowlers are an Undead Zombie Minion, like the Swampie, and are also 8 bit monsters. Unlike the Swampie, Prowlers are your new fangled running zombie, you know the ones from movies where "slow zombies aren't scary anymore". As such, they have a whopping movement of 8! They are also a bit more faster on the attack and feature two action points. Like their slower cousins, they also have Grabby and Mob, making them just as much of a pain in melee. But they are also just as weak defensively, featuring 1 Heart and 1 star ARM. Prowler also has Stealth, which helps keep it from being attacked by ranged fighters. Prowlers hit a little more consistently than Swampies, with 3 Blue Die STR for melee attack and they also have an offensive action called Homunculus. Homunculus is a range 1 melee attack and if it inflicts a wound, you may remove a wound token from one Witch on the board. This pairs excellently with the Shamble Priest's Wakey Wakey ability, or even with the Witches from Von Drakk Manor's Pumpkin Patch spawning point, as well as Beatrix the Witch Queen after she's hit timeout. Pudge was a chore to paint. His skin turned out well in the end, but in progress it took forever. I think I had something like 3 or 4 hours into it, because it would be going along nice and smooth, then a mistake would happen. The color went from a decent undead skin tone to roasted chicken and back a few times. I really wanted to do some kind of design on his shirt and tried a few things on it. Nothing really worked though and I gave up, deciding on a plain shirt instead. There has to be at least 20 layers of thin paint and washes on Pudge's skin. Overall, I'm mostly happy with the end result, but also glad to be done with him. Pudge is another 16 bit monster for this spawning point and like his skinnier brothers, he's an Undead Zombie Minion. Like the Swampies, he's slow at 5 movement and only has 1 action point. But hes' wide and can be used to block doors and hallways. He's also got the ability to Mob and is Grabby. Pudge only has 1 star ARM, but he has 2 Hearts, giving him a little more up time. But you don't want him to live for long, as when he dies he gets Gross. Gross says" When Pudge is destroyed, before removing the model, resolve the following action. Offensive Action, Melee, Wave 1, +1 Red Die STR". He essentially explodes like a Boomer from Left 4 Dead. So you want to wade him into the party and hopefully he'll die from Backlash attacks on the Consul's turn, not giving the Heroes time to relocate and let the ranged fighters handle popping him. Pudge also has an Offensive Action that he can use while acting as a road block, called Disgusting. Disgusting is a melee attack, Lance 3 +1 Red Die STR and if it hits it gives any enemy model hit the Poison Status effect. He pretty much pukes a stream of nastiness on the party. And finally we have Gruesome George, a new Frankenstein's Monster style mini-boss. Gruesome George is probably my least favorite paint job for SDE in recent time. I don't like how his skin turned out, his hair is funky and the pants seem off. The rusty metal sections turned out ok, but otherwise I'm just glad that he's finished. I painted his pants in a red and green striped pattern, similar to Freddie Kruger's sweater and I tried to give him dirty white hair similar to Beetlejuice. Overall though, I think the biggest issue I have with him is, I just don't care for the sculpt. His face is odd and he's just not living up to his artwork, as far as I'm concerned. It actually took me a couple months of on and off painting to get him finished, just because I wasn't feeling him at all. As for gameplay, I actually liked using him a lot. He reminds me of one of the encounters from Naxxramas, Thaddius the end boss of the Construct Quarter. Gruesome George is a Mini-Boss and he's chock full of abilities. He's got decent movement, with 6 movement points and he has 3 action points. He's only got 2 Blue Die armor, but 6 Hearts. Like other zombies, he's got Mob. But he's also Tough and regenerates a wound every round. He also has Static Charge which boosts his STR and ARM by 1 Blue Die for each wound he is suffering (Up to 3 Blue Die). This adds to his longevity. But that's not all. His Electric Jolt allows him to spend 2 action points to heal a wound as well. George isn't all heals though, he has 2 offensive actions. One called Static Discharge and another called Brilliant. Static Discharge is a melee, Wave 2 attack that adds +1 Blue Die to his attack roll and hits any enemy within 2 squares of him. Essentially blasting out a wave of electricity to zap enemies. Brilliant is a melee range 6 attack that adds +1 Red Die to his attack, but he also suffers a wound for using it. But that would could end up boosting his stats, as long as he's not up to his max of 3 bonus die from Static Charge yet. When this set first came out, I was like "great a zombie set, everything has to have zombies now-a-days". I could say that I wasn't too hyped for them, but I did like the addition of Marie-Claude's hero and thought she was pretty solid. Even after looking over the cards and trying to see how well they'd mesh with the other Von Drakk horror themed minis, I wasn't sure on them. This is a Paired Spawning Point, which means it won't be run with the skeletons from Von Drakk very often, unless it's a 4-5 hero game. That leaves the Pumpkin Patch solo spawning point as the only viable theme option for playing a all horror game, when running a 3 hero game. I like synergy in my troops, and that may be from years of playing Magic or other games. But when looking at the Stilt Town Zombies with the rest of the Von Drakk stuff, I just wasn't sure where that synergy was going to come from. That was until I played this last Tuesday. I hadn't realized that the Prowler's Homunculus ability targeted Witches. And in the beta rules for SDE 2.0, you can spawn any monster from the spawning pool that you want out of any spawning point. That's when I realized that the witches from the Pumpkin Patch point were a great fit with the zombies, as I can use the witches to get in and toad heroes then use the prowlers to heal them. This was even better when I realized that Homunculus can target Beatrix the Witch Queen as well and that I can pop out two Prowlers and the Shamble Priest at timeout and then pop out more zombies to keep the heroes at bay, while I Homunculus attack to heal Beatrix back up. It's a thin synergy link, but it was enough for me to really dig running them. As for gameplay. Super Dungeon Explore is all about the heroes attacking the dungeon and getting the boss to spawn on their terms. The zombies slow the party's movement down considerably, thanks to Grabby. If the first tile they are in contains a Grabby House (under Forgotten King rules), or the Spawning Pool contains the zombies (under 2.0 beta rules), its possible that they will struggle to plow through the first point and race to the second. In our game using the beta rules, which feature the Might Monster Chart that acts as a timer counting down to an automatic boss spawn, the heroes never even got out of the first tile. That chart is 12 rounds long too. That's a lot of time bogged down by zombies thanks to Grabby. Overall, I think this is a pretty solid addition to the game. Gruesome George was fun to use and the zombies add another tool in the Dark Consul's bag to hinder the heroes progress. But I can totally see players groaning if the zombies come out too often, as they can slow the game down. And under Forgotten King rules where its all about popping spawning points as fast as possible to get the boss out, I can see it adding a lot of time to the game. The fastest I've ever played SDE 3 Heroes under Forgotten King was 3 hours, I haven't tried it with zombies yet. This isn't as much of an issue under the new 2.0 Beta rules since the Mighty Monster Chart sets a timer on the game and as soon as the boss spawns, monsters stop spawning and it's boss fight time right here, right now. Would I suggest picking it up? Well if you're an SDE fanatic, like I am, I don't even need to answer that question. But if you're just starting out and looking to add a bit of variety to the monster pool, I'd say maybe. 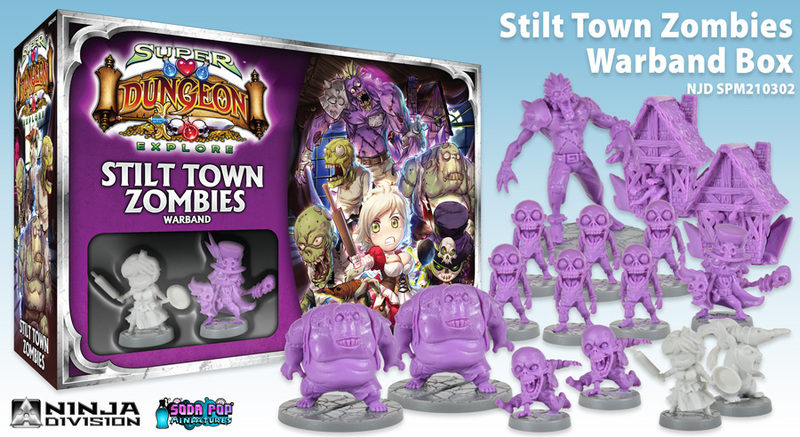 I would suggest picking up Von Drakk Manor before picking up Stilt Town Zombies, as it adds to the horror vibe as well, but gives you enough models to run a 3 hero horror themed game without cobbling in a single spawning point from a different region of Crystalia. Either way, I'm happy with all the sculpts and game mechanics in this set. Sure some of them were a bit of a chore to paint than others. But you'll have that with anything, really.